Here is an example of the SAME LARGE NUMBER WATCH FACE on three of the different styles of watches for Men and Women. You choose the style and you get to personalize it too or just Delete the Text in the text boxes by highlighting my temporary text and deleting it. 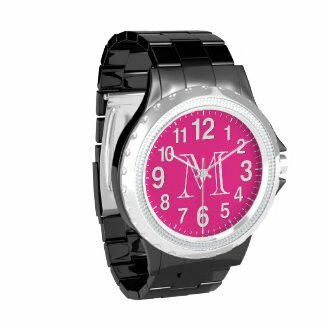 Most of the Customizable Watches from Zazzle, regular Retail Price start at under $50 and go to under $100. You can see some Timex watches below that cost less yet still have larger numbers. Instructions BELOW on How to Type YOUR TEXT into Text Boxes and Choose Your Watch Style. All of the Easy to Read Watches are available in All of the Watches are Available in Every Style in the “Style Options” area to the lower right of each product. Type in YOUR NAME or Any Text in the TEXT BOX Templates located on the right of each watch. You can also Delete any Text you wish. Select ANY STYLE Watch in EVERY DESIGN. Go to the STYLE OPTIONS area to see the Customizable Watches for Men, Women and Children. Type in YOUR TEXT in the Text Boxes to the Right of Each Watch or DELETE the Text altogether. Type in Grandpa or Grandma or anyone’s Name or Message or Delete the text altogether. No Second or Minute dashes in this Low Vision Watches for Men, Women and Kids for those that like a cleaner look. Change the Style to Women’s or Children’s Watches under the “Style Options” section in the lower right. The Black Leather Vintage Watch band is so soft and comfortable too. Nice Big Face Watches. 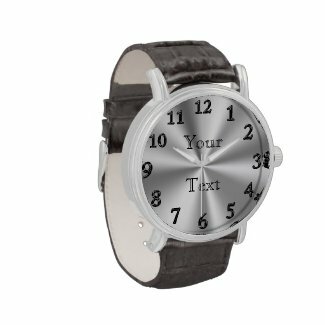 This silver face mens watch background color can not be changed. See other watches below for customizable face colors and the INSTRUCTIONS. 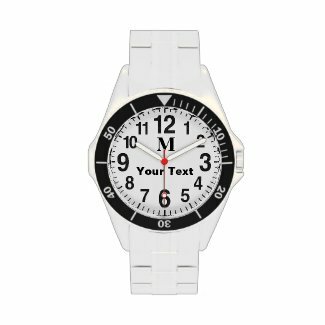 You choose the Style and type in YOUR TEXT or YOUR NAME into the text box templates on the Low Vision Watches for Women and Men Product Page. Lots of nice styles. Some are available with different colored bands too. Every Watch Face Style is available on EVERY WATCH. See “Style Options” to select your watch style. I not only designed the NUMBERS to be large but also the Second and Minute Hands to be heavier lines. The Numbers are also simple but good looking numbers. Sometimes people like me who just want to look really quick at their watch and want to read it quickly, enjoy a large number watch. You will appreciate the 100% Guarantee that Zazzle offers too. If you don’t “LOVE It” you have 30 days to return it. Impressive Less than 1% Return Rate speaks volumes to me. Change the background COLOR by clicking on the “Customize it” Button then Choose one of the Color Boxes below “Background Colors” to your slightly lower right or Click on the tiny “Eye Dropper” Icon for lots of Color Options. Not only Pretty and Practical but these Large Number Watches for Women are so easy to see. Simple Numbers, Thicker Second and Minute Dashes and it is customizable too or just delete the Monogram. Underneath the “Personalize it” section, in the Text Box, Type in YOUR MONOGRAM or just Highlight it and Delete it. You can even CHANGE the FACE COLOR to any color by Clicking on the blue “Customize it” button under the Monogrammed Watch. To your right beneath “Customize it” Click the drop down box “EDIT” then at the very bottom you will see Background. Click “Background” and then select your favorite Color Box or Click the blue word “Advanced” and type in YOUR Pantone COLOR CODE in the box in the upper right. CLICK “DONE” and you just created your own personalized watch. This is the Silver and Gold Two Tone Watch for Men but you can change the style to any style. CHANGE “Grandpa” to ANY NAME you wish in the Text Box to the right of the Grandpa Watches. These Two Tone Watches with the Blue Face is really sharp looking. You can change the color of the watch face by following the direction on “How to Change Background FACE Color” above. IN the “Style Options” section you can choose a Different Style Watch for Women, Men and Kids. All of my designs can be customized to your desires. I can do it for you too. See my Contact information below or Call Linda at 239-949-9090. How about an easy to read Watch designed specifically for Men, Women and Children who have difficulty reading the numbers on watches. I created Clear, Concise, Simple and Large Numbers with extra thick Lines for the Second and Minute Hand. Every single one of my watches can be changed to a any MEN’S, WOMEN’S or KIDS style watch by selecting a different style underneath “Style Options” on the lower right. Here is what the Style Options area looks like. I actually initially designed this watch with the Vintage Leather Band but here is where I changed the style, to the right of the Low Vision Watches under “Style Options” to the Stainless Steel Watch for Men. Zazzle lets you see how much more or less a certain style costs. The regular prices of most of the watches are around $50.00 to $100.00 depending on your selection and sales going on. 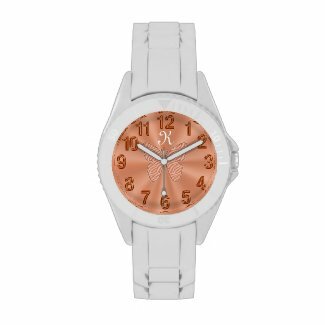 Monogrammed Watches for Women with Pretty Watch Face similar to the Rose Gold Watch Womens, Butterfly and Type in YOUR MONOGRAM into Text Box to the Right of the Monogram Watches. Note: This Large Number Watches for Women isn’t going to be the easiest number to see because of the cool glassy like LARGE NUMBERS and the similar coloring. I styled this with monochromatic type of feel for these rich golden peach watches. This is what the “Style Options” Area looks like. You will find it on the Customizable Watches Page to your Lower Right hand side. Just Select a different style watch to see how it looks and the price. Select YOUR STYLE HERE when you are on the product page. Here are some great Large Number Watches for Women, Men and Kids from Amazon. My Mom has this Easy Reader Watches Women Model and loves it. It is inexpensive, has larger numbers than many watches and it lights up too. The only trouble is the lighted feature stopped working. The Stretch Band Watches are convenient to take on and off and fit nicely. Adjustable comfortable expandable band.